There are hundreds of thousands of phone apps available for download. These apps can be used to wake you up, to show you where to shop, to help you count calories, or to log your exercise minutes. But they can't actually make you get up, control your spending, manage your diet, or force you to exercise. The App Store isn't the only place you can find apps. Did you know that the Bible has also given us many "apps" to enhance and improve our lives? In this 6-part series, Andy Stanley and Jeff Henderson identify five life applications worth living by. Life Apps DVD by Stanley, Andy was published by North Point Resources in July 2016. The ISBN for Life Apps DVD is 713757745413. 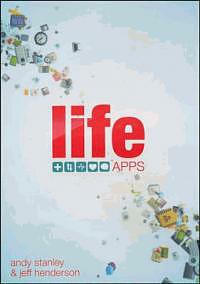 Be the first to review Life Apps DVD! Got a question? No problem! Just click here to ask us about Life Apps DVD.